The Kansas City Royals are hoping for a third consecutive promising start from rookie Brad Keller when the right-hander goes for a series split Sunday afternoon against the Oakland Athletics. Danny Duffy got the Royals headed in a positive direction with seven shutout innings Saturday in a 2-0 win that snapped Kansas City's six-game losing streak. The A's will counter Sunday with left-hander Sean Manaea. It has been Oakland that has had its young pitchers on display so far in the series, with Paul Blackburn, Frankie Montas and Chris Bassitt combining to limit the Royals to 12 hits and four runs in 20 2/3 innings as the A's posted 4-1 and 7-2 wins Thursday and Friday before Saturday's narrow loss. Unlike the Oakland trio, all of whom have spent a majority of their time in the minors this season, Keller (1-2, 2.12 ERA) made the Royals' Opening Day roster after having been a Rule V claim from the Cincinnati Reds. The 22-year-old was converted to a starter on May 30 after 21 relief appearances and has since pitched 7 1/3 innings in two starts, allowing eight hits and two runs. He was limited to three innings and 51 pitches in his starting debut against the Minnesota Twins before getting into the fifth inning Tuesday against the Los Angeles Angels. He was pulled after 4 1/3 innings and 75 pitches. He insists he's ready for more Sunday. "I felt good going into the fifth inning," Keller said of Tuesday's start, during which he threw 24 more pitches than on any previous occasion this season. "Obviously, I'm looking forward to getting stretched out a little bit more." Keller has never faced the A's. Manaea (5-6, 3.59), on the other hand, knows all about the Royals. He was acquired by Oakland from Kansas City in July 2015 for Ben Zobrist, who helped the Royals win the championship that season. The 26-year-old has faced the Royals just once in his career, throwing five shutout innings in an 8-0 win at Kansas City in 2016. He got the win in the game. Manaea will have to deal with a new look the Royals debuted Saturday, one that slotted Alex Gordon in the cleanup spot for the first time since 2014. 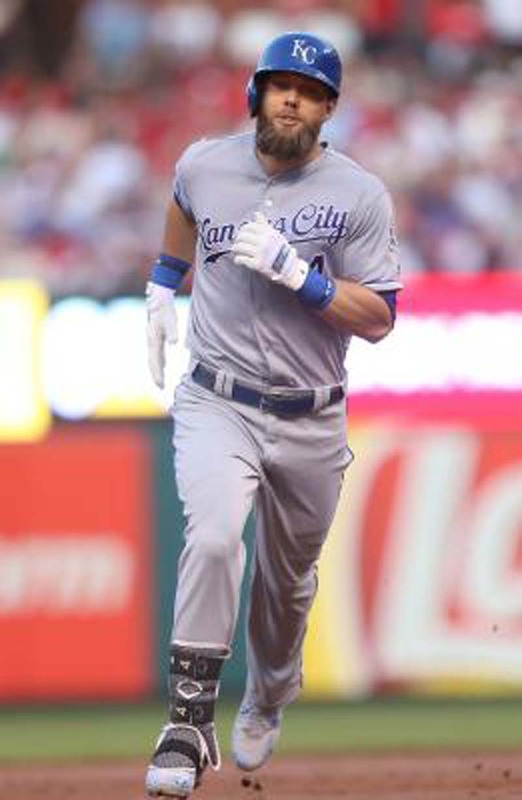 Gordon responded with a home run, his fifth of the season, to complete the Kansas City scoring in the 2-0 win. The new lineup produced a win but didn't do much to shake the Royals of their recent batting slump. They've totaled just eight runs in their last five games. Neither team displayed much offense Saturday, with each collecting just four hits. Matt Chapman had three of Oakland's four, including one with two outs in the ninth inning that gave Stephen Piscotty a shot at tying the score. But Royals closer Kelvin Herrera struck out Piscotty to end the game and give the Royals their first shutout win since April 9. Chapman was the most productive hitter in the first three games of the series, going 6-for-10.